****Please note: Mechanics of the Oracle Positions were changed in the summer. The purpose of attacking Positions is to help you to exchange the troops you can build with the troops you cannot build yet or have a hard time building. So, it's optional, and not recommended if you cannot build troops. Attacking too many Positions or taking on ones that are too difficult will lead to you losing all of your troops. The process of hitting Positions to get rewards will be quick at first, but as they get stronger it will increasingly long periods of days, weeks and even months of continuously building troops. I will show you step by step how to do the calculation and track all your troops lost against Positions and how to predict when your payouts will arrive. One trick is to throw troops at Positions to weaken Xerxes’ forces but not eliminate them completely, save those until a Global Quest fires, then finish them and get more GPs as well as global quest rewards and the regular payout of the Position at the same time. 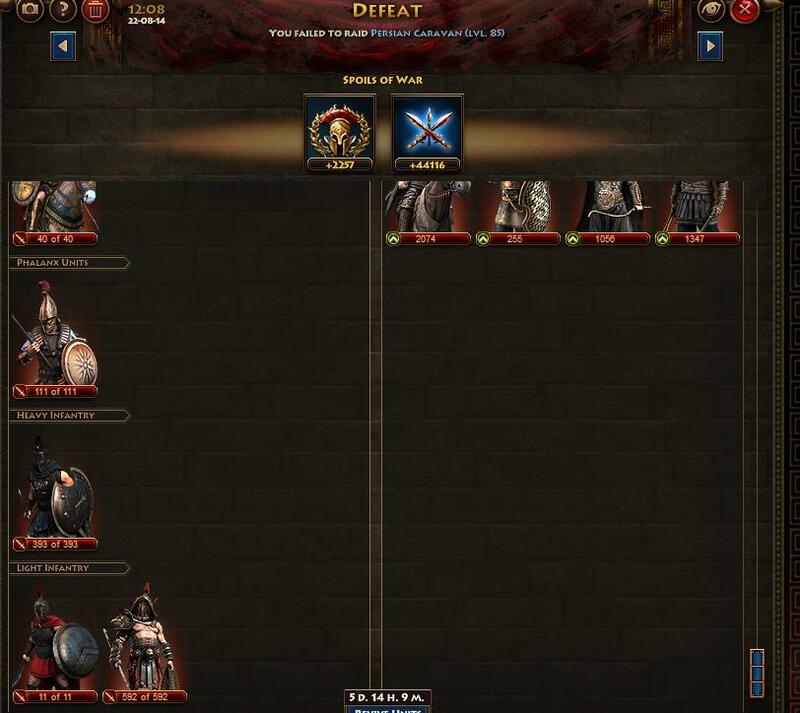 This tutorial will help you step by step with understanding how to track your troops lost, then estimate the time when you can get your next reward. After you understand the rules of Positions, you can find many ways to optimize your Position attacks. First of all, you need to record your last reward. If you don't have that, don't worry, just practice tracking your losses first, and keep building troops and wait for a reward you can record. Don't get sucked in by a big reward and rush in to attack a Position. I built 4 layers of troops from light to cavalry all day for months, and revive Agema Horsemen also to speed up the process of troop buildup. Now, I need to keep records and see how much I need to put back to a Position to get the next reward. I usually call this process "deposit". Remember that the system counts all your troops in terms of resources. 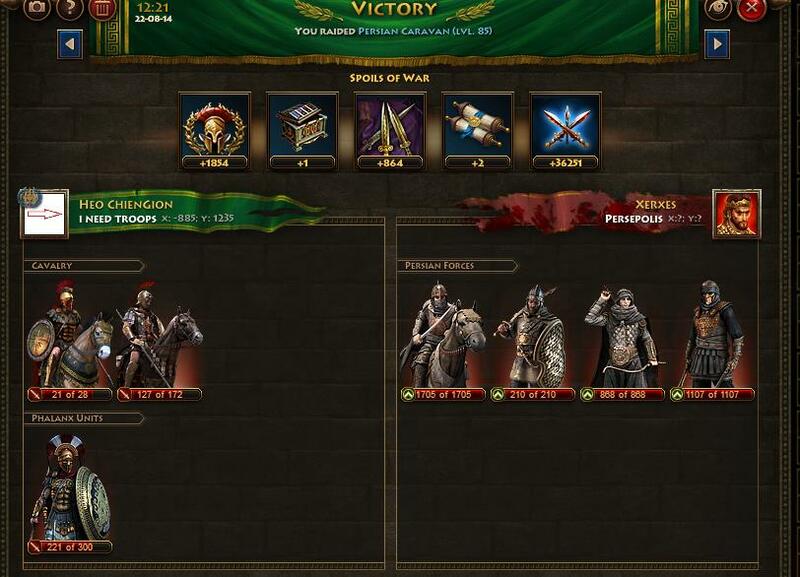 That's how it calculates how to convert the troops you build to the higher level troops. The resources you receive in payout are also part of the payout, and you need to add it to the total rewards you receive. 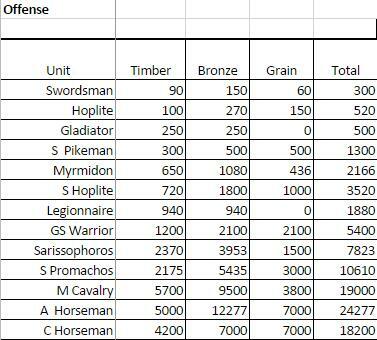 These are the resource value of troops that your Oracle used to calculate if you get payout or not. 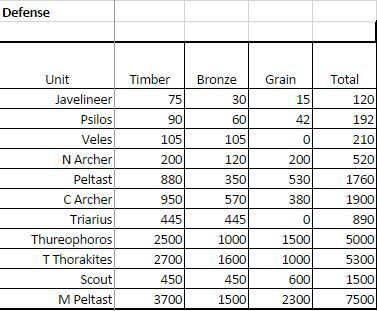 These values are actually the total of all the resources: the timber + bronze + grain that you need to build those troops. Revived troops have the same resources value as built troops. So, the value of 4331 Mounted Peltasts is 4331*7500 = 32,482,500 resources, together with the resources reward of 136,070, therefore I won 32,482,500 + 136,070 = 32,618,570 resources in total. You will notice that I stopped doing from last global quest and wait until this global quest to do it next. While I wait, I keep building troops. You can throw some light troops against Positions to reduce the strength of Xerxes, and I can throw my light and heavy troops to fight in PvP quest to get more Spartan Promachos to use in the next global quest. You have a choice and many ways to act, but keep building while waiting for next global quest. I was in a Pantheon team this time, so I wanted to get the big reward in Defense. I will sacrifice a large amount of Offense troops. But you can do things the way you want to improve your troops. So I can see I deposited about 2.99 mil resources where as my last reward is about 32.6 mil resources. Such a long road ahead. There is a powerful tool created by Aaron Janusz to help you play with Oracle Position, and you can download it here. Keep hitting more. I recommend you to build a lot of troops to do. Because I can revive troops when I need, and my troops is huge, so I can afford the loss to throws all kind of troops. But for regular condition, keep patient and build more to hit. Now, I deposited 8.2 mil resources. Still a long way ahead. And next, of course I know no reward, but I have to keep hitting to "deposit". Now, I deposited 28.7 mil resources comparing to last reward of 32.6mil. Almost get there, now I need to double check that I will have enough deposit to get reward in next hit, and I expect it in Defensive side. I choose to hit Defense Position level 85, its average strength is 877000. But because it has a lot of Xerxes' cavalries, while I have lots of Mounted Peltasts and Thureophoroi so I will hit it and need less strength than required. I will expect to use those amount of Defense to finish the last hit. It requires 7.6 mil resources, while I deposited 28.7 mil resources. So the total deposited will be about 36.3 mil resources, more than the reward last time of 32.6mil. I'm confident with next reward coming out. Or sometimes it stuck, and just 1 more hit, then you will get it. Putting back this reward to check, and its value is as 37.3 mil resources, more than the amount I put in as 36.3 mil. So I know that no more reward coming out next. And I stop here, build troops and wait for next global quest. If you check and see that your reward is smaller than your deposit, then there will be another reward coming out. Doing a while and tracking your loss, you may find many strategies to do with Position. Good luck, and have fun. HEO CHIEN GION - THE LITTLE SOLDIER. 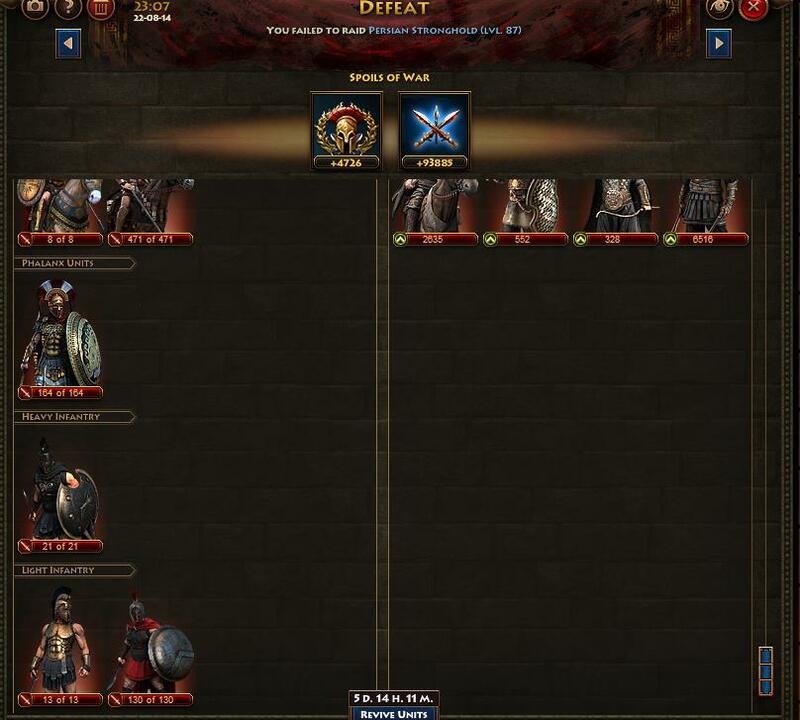 Join Heo Chien Gion in the quest for glory - Play Sparta: War of Empires Now! 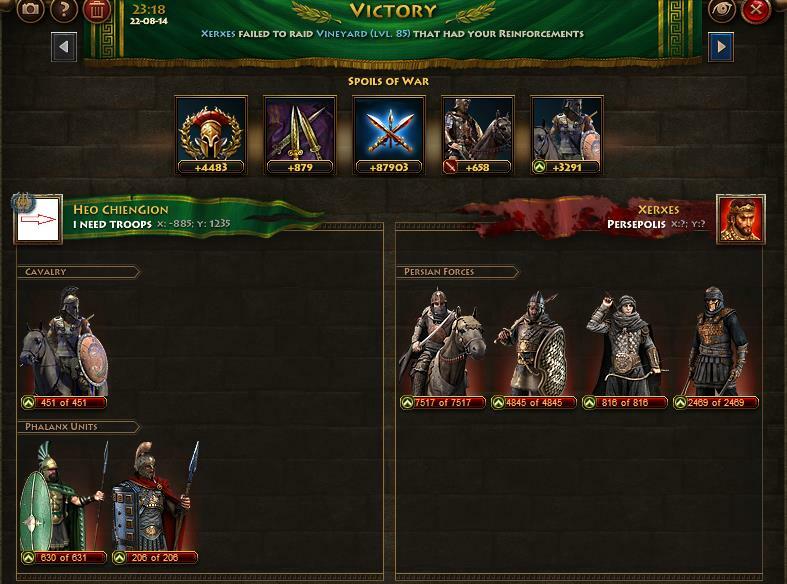 This article was written by player Heo Chien Gion, who granted permission for it to be posted on Plarium.com. 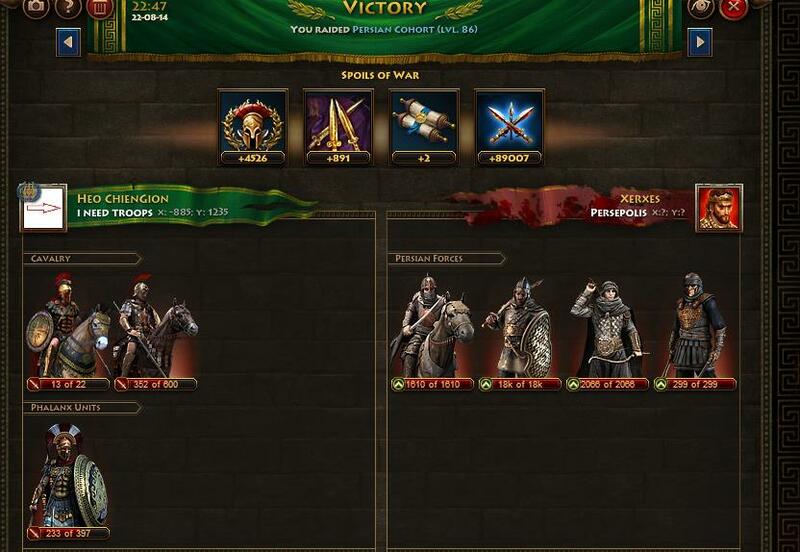 Any thoughts or views expressed herein are the player's own, and do not necessarily reflect the views of Plarium Global.